Maria Lokken | What goes into making a documentary? What goes into making a documentary? Ted Fisher is a multi-talented writer, producer, editor and documentary short film maker. 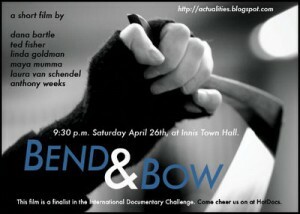 His documentary Bend & Bow can be seen on Netflix as part of the International Documentary Challenge DVD. I spent some time chatting with Ted about his process as a film maker and as a teacher. Interview With Film Maker Ted Fisher Part One. Your documentary Bend & Bow was created in five days for the International Documentary Challenge – how did you choose your subject and what steps did you take to finish within the time constraints? Ted: When people imagine making a documentary, they picture going on a shoot somewhere beautiful, exotic, perhaps dangerous, or think about crafting material from a stack of tapes into something an audience will enjoy. It’s easy to forget the essential process of documentary work is developing an idea and then gaining access. Nothing happens without good planning and the ability to find and ally with the right subject. Even if you think of yourself as a director, an editor, or a cinematographer, you’ve got to immerse yourself in the role of producer and take care of those tasks — or there is no film. For Bend & Bow I worked with five other filmmakers. We’d participated in the Doc Challenge the year before, making Blind Faith: A Film About Seeing. For that film we followed a group of blind photographers on the last day of their exhibition at a Manhattan gallery, and tied that with the Empire State Building going dark to draw attention to the issue of preventable blindness. The film made it to the Doc Challenge finals, but we left the process exhausted and felt we could have made the film better if we had worked smarter. So for Bend & Bow, we took every element seriously: we made a list of possible topics and subjects, preparing for any genre and theme we might draw in the Challenge. We then did the hard work: we secured a “yes” from every one of our possible subjects. We acted like we were producing several short films, and prepared to shoot any of them. When we received an email at the start of the challenge, telling us that the year’s theme was “Change” and our genre was “experimental” we took a phone vote — and were most excited about following Natalia Paruz, a musician who plays the saw in the New York subway. We knew from our pre-production discussions with her that her life story involved major change, and of course busking musicians are generally paid in “change” also. More importantly, we found our conversations with Natalia captivating. My best advice is to not start a documentary unless you find the main subject exciting. If you’re not fascinated, no one else will be. 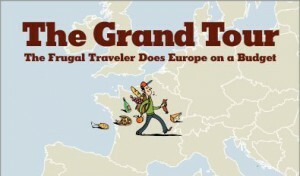 The Frugal Traveler: The Grand Tour features 13 European Cities in 12 weeks. The series gives viewers a look at the Old World through conversations with the people you encountered in your travels. How much footage did you shoot compared with what was seen in the series? Were there stories you wished you had more time to tell? The summer before, I worked as producer on the Frugal Traveler: American Road Trip series, which was the New York Times first venture into serial programming. The idea was that travel writer Matt Gross would take a summer road trip in an old Volvo, and report in each week with a video in addition to his written piece. 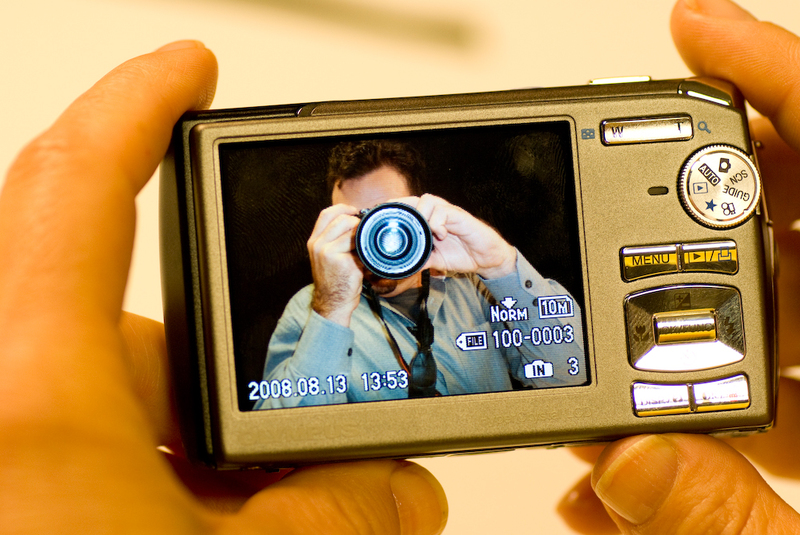 At the time there was a lot of excitement about video blogging, and if you looked around the Web you could have seen a lot of video shows that were really just someone talking to the camera, maybe standing in an interesting place but maybe just against a plain background. But Matt is a good writer, and definitely wanted to go further, and my background is documentary, so I wanted to angle the show towards those concerns, and the Senior producers were very supportive but wanted an emphasis on the characters Matt would meet. So the three themes blended: Matt’s personal thoughts on travel mixed with some documentary material emphasizing the experience, mixed with the type of quirky characters you find in every city in the U.S. It worked well (the series won the Webby for Online Film & Video in the travel category) and we made it seem enough like a crewed television production that I’m not sure people understood what a high-wire act it was: Matt really did travel the country alone with a small touristy camcorder, pulling it out when people seemed willing, then uploaded the footage online with a proposed script. I usually had less than 12 hours to edit the piece — a great learning experience and editing exercise, but nerve-wracking and challenging. So when the series expanded to Europe the next year, the idea of how stories would be developed was exactly the key production point: Matt traveled alone, shooting what he thought could be the week’s story but aware that once the footage and script arrived at the New York Times’ there would be a very pragmatic process. Based on input from Senior producers, the task of constructing something that works out of limited material, as well as the context of the series, there were always hard choices and stories that were in the assembly draft, then cut from the final edit. Usually Matt shot a good amount of material, following several possibilities. The most common outcome was that one of the mini-stories he’d tried for would get cut: I’d do an assembly based off the script, we’d see how long we were running, and then usually the first step toward finishing would be to trim out at least one of the encounters he’s had during the week. So some charming characters went into the trims bin, and a few surprising adventures as well. The goal always had to be for a watchable, coherent video, though — and it had to fit in the overall arc of the summer journey, too. For me, two things happened that I found most exciting: in one episode, after he had finished filming everything else, Matt got a chance to meet immigrants struggling to survive. It shifted the episode from the traditional material of travel video — see art here, eat food there, don’t miss this — to one where the idea of traveling as luxury was contrasted with those who travel because they have to. It meant we pushed the edit right up to a late-night deadline, but made for a story that was worth telling and an experience that no one had expected to see. In another episode, Matt set out to hitchhike around Cyprus. That’s not the kind of experience you can communicate with a “star” followed by a big crew. A single person with a tiny camcorder, however, could get across the feeling of waiting, as the sun goes down, to find one last ride out of the middle-of-nowhere to somewhere to stay for the night. Part Two – My interview with Ted Fisher continues tomorrow. Ted talks about his documentary Hoop Springs Eternal, teaching and film school. Find out more about Ted by visiting his blogs New York Portraits, and Actualities and his website. This is a terrific interview – thanks so much. I’ve never worked on a documentary or with a documentary film maker; however your commitment to ‘work smarter’ really hit a cord with me. It’s interesting how with each project one learns what to do on the next one. You’ve certainly demystified the experience and I see that being a documentary film maker encompasses wearing a lot of hats. Do you ever ‘argue’ with yourself – in other words – does the producer in you often fight with the cinematographer in you? Do you constantly have to juggle time and budget constraints with the artistic process? Heading over to Netflix now to check out Bend and Bow. Maria Lokken » Do we really need TV news updates in the bathroom?